Thor Ragnarok is one of the best Avenger movies, to date. It is funny and serious at the same time. The casting is spot on and the continuity between dialogue and acting is smooth and graceful. 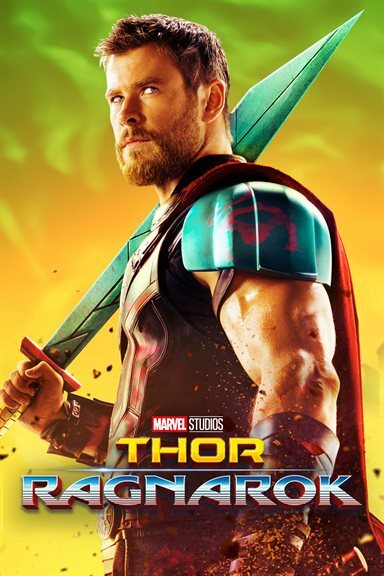 One of the most anticipated Marvel movies to hit the big screen in 2017 was Thor: Ragnarok and now you can bring this incredible movie into the comfort of your home. Marvel Studios did an incredible job with the cast, music, and dialogue and when it ends you will wonder how time can go by so quickly. It leaves you with a sense of longing that you are sad the next movie will not be released quick enough to satisfy this hunger you have for the next part of the story. Thor: Ragnarok takes Thor out of Asgard for much of the film. He is imprisoned far away from Asgard, loses his hammer, and ends up on a planet ruled by a very eccentric Grandmaster, where he is forced to fight Hulk in a ring. Escaping the planet of lost things, Thor races back to Asgard to find much changed and Ragnarok on the loose destroying his planet. Turns out that Ragnarok is the least of Thor's problem- he has an older sister he never knew about who wants all of the power and he discovers a history he was never told. Chris Hemsworth (Avengers: Age of Ultron) is Thor. There is no other actor capable of being Thor. With some actors, you can see how they are playing the character and most do an amazing acting job but Hemsworth is simply Thor. His persona exudes this Prince just trying to help the world. He tries to stay loyal to his family- and brother- despite everything that happens- and he remains steadfast in his loyalty to his friends- new and old. The excitement that Hemsworth barely contains upon seeing Hulk in the ring was childlike, full of innocence and joy that he yells – "YES! We know each other! He's a friend from work!" Another actor that simply is the character he plays is Tom Hiddleston (Kong Skull Island). Hiddleston is Loki, Thor's brother- or as we have come to find out- his adopted brother. Loki is the character we want to hate but end up loving. Despite what he thinks is deep-seeded hatred or jealousy of Thor and their father, the audience, as well as Loki, himself, slowly finds out that despite his horrific actions against Thor and Asgard, adopted blood is thicker than water. Of all the characters, you can see the huge emotional growth in Loki more so than any of the other characters. Hiddleston's emotions are clear as day on his face and in his body movements. His inflections when delivering lines are so on point and natural that one forgets the dialogue is pre-written. Hiddleston also plays off of Hemsworth brilliantly and the two make a great, albeit strained, duo. The Grandmaster is another brilliant character introduced in Thor: Ragnarok. Played by Jeff Goldblum (Jurassic Park), the Grandmaster is an eccentric ruler of a planet where all things lost are found. The Grandmaster has a very overly dramatic way of speaking and making decisions and Goldblum brought dual emotions to that role as no other actor can do blending both hilarity and seriousness at the same time. Goldblum and Hemsworth definitely have a chemistry in these scenes that makes the dialogue flow and the acting smooth. Cate Blanchett (Lord of the Rings) is Hela, Thor's older sister. Released from her captivity, Hela wants what she had before Thor existed. Anything good from the royal bloodline is clearly in Thor while all the deception and hunger for ultimate power with no thought in mind of the people belongs to Hela. Unlike with Loki, a character that does the right thing in the end despite all the horrors he caused, there is no sympathy for Hela because she has no redeeming qualities. Blanchett does an amazing job of depriving the audience of any sympathetic thoughts you might have for this character. I watched the digital version on Movies Anywhere, which will also point the version to your streaming app, also, for the most part. The video quality is clear and details, to the blue under the Grandmaster's eyes, can be seen clearly. Audio is crisp. Sound effects are heard beautifully and supporting background music does not overpower the dialogue. The digital download version also comes with many Special Features. First, there is the Movie with the Director's Intro. This is not your typical "describe every scene and why" into. Director Taika Waititi is funny and unique and a pleasure to listen to and also provides us with Audio Commentary. Other extras are a Gag Reel, 8-But Sequences (see how the flight and battle sequence were created), as well as nine deleted scenes. Even more bonus features are provided in a section entitled "Featured Extras" containing Team Darryl (Darryl looks for a roommate and only the Grandmaster responds); Marvel Studios: The First Ten Years- The Evolution of Heroes (see how each Avenger is developed and why Avengers is so unique- this extra even mentions Avengers: Infinity Wars); and Thor and Hulk: A Galactic Adventure (exploring Hulk and Thor's developing relationship from the first meeting to their exploits in Ragnarok). Thor: Ragnarok is one of the best Avenger movies, to date. It is funny and serious at the same time. The casting is spot on and the continuity between dialogue and acting is smooth and graceful. Download Thor: Ragnarok from the iTunes Store in Digial HD. For more information about Thor: Ragnarok visit the FlickDirect Movie Database.